Notations is an interactive musical installation, enabling viewers to instantly compose music and produce clefs on a projection screen. 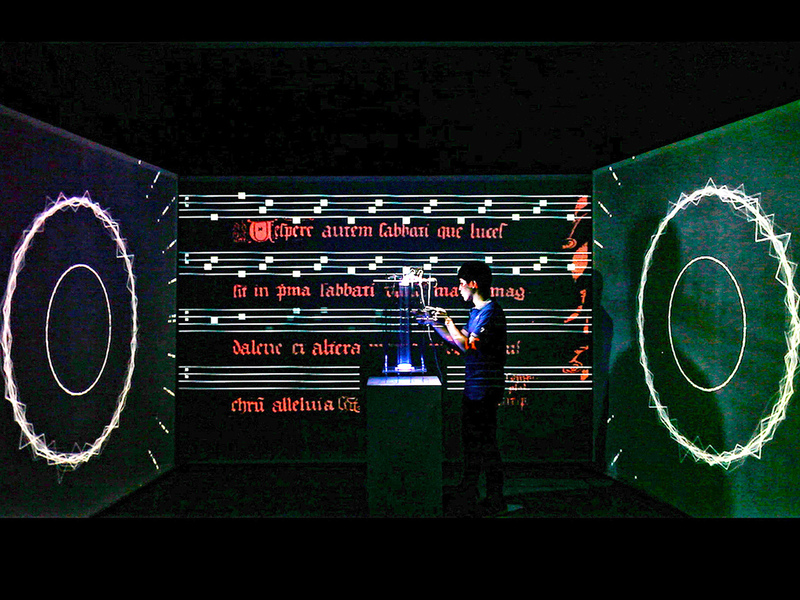 To initiate the interaction, the viewer touches strings, triggering the projection of musical notations. Simultaneously, one of the screens displays an interactive animation. The idea of using music sheet design came from Gregorian Chants, referring to the musical scores used in the mid-5th century Western Europe. Today, as part of the technological generation, the Digital surrounds us in all aspects of our lives, including music. The objective in Notations is to use interactivity to explore the conversion of the digital signal back to the original source of musical notations, expressing the digital aesthetics of interactive technology art and collaborative creation, and imbuing digital kinetic instruments with enhanced cultural and musical qualities.